What’s the best way to tell how a country is doing (and serving its citizens)? It’s not just a measure of economic output, that’s for sure. This new index tracks everything from opportunity to health to sustainability. Guess where the U.S. ranks. For many years, the powers that be thought that economic indicators were the ultimate measure of a country’s well-being. That’s starting to change. As we have discussedbefore, the general happiness of a country doesn’t always correlate with its wealth. In fact, economic indicators don’t match up with a number of important indicators about well-being. Hence the Social Progress Index, an initiative from The Social Progress Imperative and Harvard Business School Professor Michael Porter that examines how 50 countries perform on 52 indicators related to basic human needs, the foundations of well-being, and opportunity. The top country: Sweden. The U.S. doesn’t even rank in the top five (it comes it at number six). These social and environmental components include personal safety, ecosystem sustainability, health and wellness, shelter, sanitation, equity and inclusion, and personal freedom and choice. Each component is calculated based on specific outcomes–health and wellness, for example, is determined by life expectancy, obesity, cancer death rate, and other factors. The 50 countries in the list were chosen because they’re a representative sample of countries around the world. They also encompass 75% of the world’s population. So who made it to the top? Here are the countries with the highest ratings on the SPI (click to zoom). A full list is available on the SPI website. There are a handful of important trends that we can glean from the index. Almost all of the wealthiest countries do poorly on the ecosystem sustainability component. “The U.S., Canada, and Australia are all struggling with that environmental measure generally,” notes Green. Also, he says, “although economic growth is broadly correlated with social progress, there are departures from that.” One example: Costa Rica (12) performs much better than South Africa (39), even though they have a similar GDP. 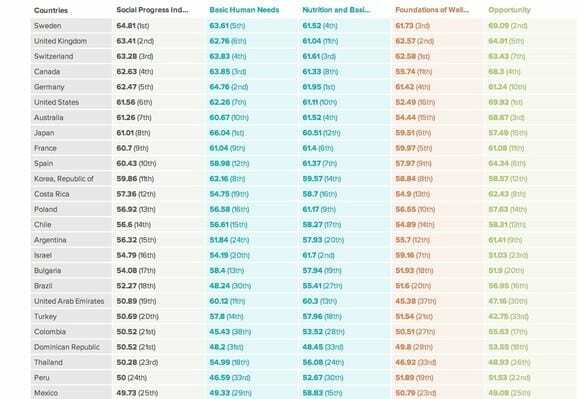 While the U.K. and Sweden didn’t perform well on the United Nations Human Development Index, they are at the top of the SPI because they have top marks across the three foundations measured by the index.